Today i will discuss about how to ZTE OLT System Log Configure. Step-2. Use the syslog-server host command to configure system log server. Step-3. Use the logging on command to enable system log function. Step-4. Use the logging buffer command to configure log buffer size. Step-5. Use the logging console command to configure information level sent to console. Step-6. Use the logging level command to configure information level of log file. Step-7. Use the logging mode command to configure clear mode of log buffer. Step-8. 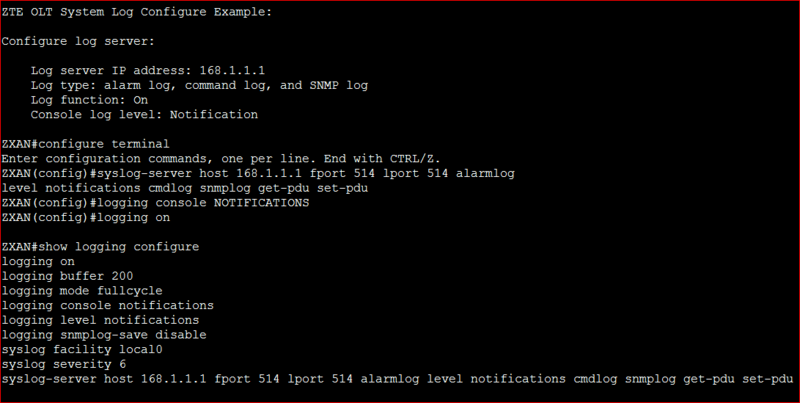 Use the logging snmplog-save enable command to enable the function of saving SNMP log to buffer. Step-9. Use the show logging configure command to query log configuration.